Los Angeles Police on Wednesday night arrested a man suspected of a string of attacks against Orthodox Jewish women in the North Hollywood area. 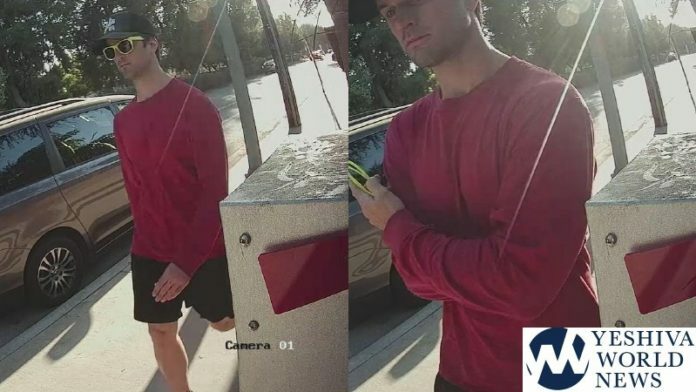 The man was seen pulling their wigs off, and was being investigated as a hate crime. LAPD says the man had been targeting several Orthodox Jewish women in the North Hollywood area since September. One of the victims, a 36-year-old woman, spoke to YWN, and said that her and another victim, an 80-year-old woman, were targeted on Yom Kippur. She says the attacks happened just one block away from Shul. In the first incident on Yom Kippur, the 80-year-old female victim was walking on Bellaire Avenue from Burbank Boulevard. She noticed she was being followed by a 25 to 30-year-old white male. When she reached Chandler Boulevard, the suspect approached her, grabbed the wig off her head, smiled and handed it back to her. The suspect never said anything and then calmly walked away. In the latest incident, which occurred this Tuesday, the suspect asked approached a a 58-year-old woman in the area of Laurel Canyon and Burbank Boulevard – in front of the preschool of a Frum school. The suspect asked if she needed help getting her equipment into the car and then pulled her wig off. LAPD say the suspect then stated to the victim, “Oh, I’m sorry” in a sarcastic manner and threw the wig on the ground. The suspect then walked away. Information about the suspect or the charges have not been released by police. Attacks on the Jewish community have become an increasing concern for local law enforcement in recent weeks, after a gunman stormed the Tree of Life Synagogue in Pittsburgh, killing 11 people in late October. The shooter, 46-year-old Robert Bowers, explicitly stated a desire to kill Jews as he engaged in a firefight with police. Anti-Semitic incidents have been on the rise nationally, according to the Anti-Defamation League, which tracks such incidents by drawing on reports from police and news publications. There were 1,986 such incidents in 2017, a 57% jump from the prior year, according to data compiled by the ADL. Just last week, someone scrawled anti-Semitic graffiti across the outside a Shul in Irvine. There have been numerous hate crimes against Jews in New York City as well. I lived there for years without ever hearing about such acts. It seems like I got out in time. It is, after all, The Land of Fruits and Nuts. I’m not so sure this should qualify as an hate crime – although I don’t mind him receiving the stiffest penalty -. Even if it’s proven that he targets Jewish women only [duh, which other (white) women wear wigs] it might simply be a (perverted) curiosity issue. In times as these we shouldn’t be overusing and abusing this term of ‘hate crime’. Remember the ‘boy who cried wolf’.